As virtual and augmented reality substitutes for “real world” oriented experiences get better and cheaper over time due to technological progress, the public will be increasingly incentivized to choose these experiences over exclusively real world ones. This will cause downward pressure on the revenues of many traditional companies that provide real world oriented products and services. In turn this downward revenue pressure is likely to trigger further automation, layoffs and improvements in operational and logistical efficiency as these companies struggle to compete with constantly improving and cheapening virtual and augmented reality substitutes for the experiences they offer. As corporate demand for human workers falls, the labor force participation rate is likely to drop to alarming levels as more and more jobseekers simply give up on finding new jobs. Increasing unemployment and underemployment will also incentivize more sharing of real world resources between consumers (and thus drops in consumer demand for those resources), as they clamor to cut living costs by using these resources more efficiently. Weakening consumer demand for these resources will in turn put more downward pressure on corporate revenues, which will further hamper the competitiveness of traditional companies versus the constantly improving virtual and augmented reality alternatives to their products and services. 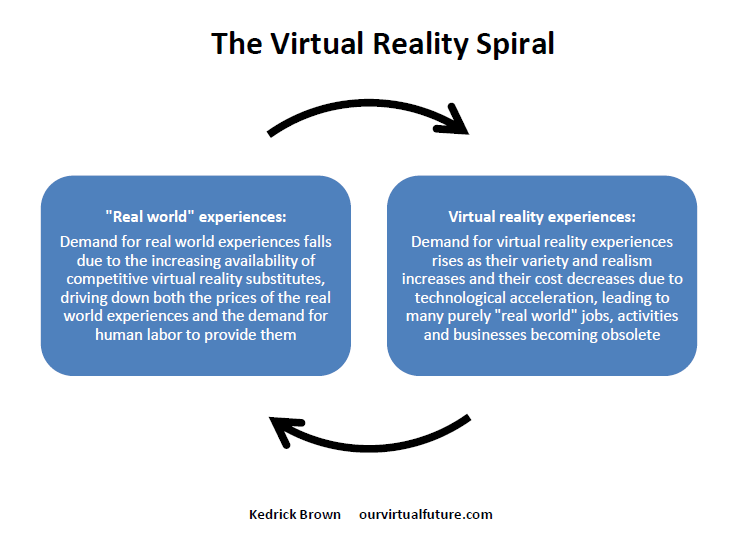 I have dubbed this process the “virtual reality spiral” (illustrated below), and in my opinion it is the most important socioeconomic process to be aware of in the decades ahead. In the long run I expect that the spiral will lead to nearly continuous virtual reality immersion by most people, in conjunction with the nearly complete automation of real world industrial, agricultural and logistical processes. Along similar lines, I noticed a recent article of interest on Mish’s Global Economic Trend Analysis Blog. Author Mish Shedlock mentions the opinion of one of his readers (named “DT”) from Brazil, who suggests that Microsoft’s Hololens has “huge deflationary potential” because users will be able to mimic a variety of physical objects in their homes with the technology. My view is that the virtual reality spiral is going to make many traditional jobs, activities and businesses completely obsolete. The effects of the spiral will probably be amplified even further in some countries due to public demands for governments to slow the resulting drops in wages and tighten restrictions on layoffs. Such actions will unfortunately make traditional companies in these countries even less competitive, as substitute virtual and augmented reality experiences that are unconstrained by national borders continue to improve and cheapen versus the products and services they offer. Although this situation may seem very bleak at first glance, I see a relatively positive long-term outcome to all of this if handled properly by society, which I plan to discuss further in future posts. To better understand why the virtual reality spiral is inevitable though, consider the table below. Using hypothetical values I illustrate that every human experience can be catalogued at least subjectively by how necessary each of the five senses is for that experience to be replicated reasonably well. For example, it may be possible to drive a car without feeling the steering wheel against your hands or the vibration of the cabin through your seat, but sight of your surroundings is absolutely essential and hearing is nearly essential, while smell is rarely important and taste is irrelevant. Similarly, the senses of sight and touch are very important in tennis but hearing is less so, while smell and taste are irrelevant. And in typical office meetings, aside from having to shake hands occasionally or move office materials around for example (which both involve the sense of touch), hearing and sight are the essential senses, while smell and taste are irrelevant. 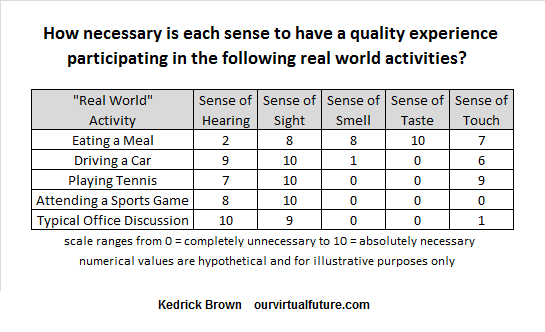 Thus there are numerous “real world” activities for which anywhere from one to three senses could be completely omitted if necessary without significantly reducing the quality of the experience. So incorporating the ability to mimic visual stimuli alone into our networked technology, in conjunction with our existing skill at mimicking audio stimuli, would lead to dramatically improved simulations of a huge number of activities. For example, virtually attending a sports game in the future using audiovisual virtual reality apparatus is likely to pose huge competition to live attendance of the same game, even though the senses of smell, taste and touch would be absent from the virtual experience. This competition is likely to become even more fierce as soon as a number of friends can virtually attend the same sports game while socializing with each other in a customized virtual reality environment. The same thing goes for virtually attending office meetings – if an in-person office meeting can be faithfully replicated in a virtual reality environment in every relevant detail except handshakes between participants, the availability of the virtual reality substitute seriously undermines the need for them to waste time and energy commuting to a centralized office for that meeting. This makes it clear that virtual reality technology, even if it provides only immersive 3D visuals and stereo sound in the near term, is in fact extremely disruptive because it will enable us to create dramatically better substitutes than we can today for a whole host of real world experiences. And of course, any substitute that replicates an experience, however imperfectly, has some economic value. This is precisely why we pay money for telephone calls. Even though phone calls only replicate the experience of speaking in person with someone for 1 of our 5 senses, this is good enough to have financial value for us. So can you imagine the power, convenience and value of a technology that can replicate the experience of speaking in person with someone (as well as numerous other experiences) with both immersive 3D visuals and stereo sound? Although the companies that ultimately deliver great virtual reality experiences to the public are likely to benefit economically, companies that fall behind with respect to the technology will conversely be leaving themselves exposed to significant downside risk. A quality virtual reality ecosystem is thus inevitable in my view, as very few companies whose industries are exposed to transformation by the technology will be able to ignore it. Future generations of wearable virtual and augmented reality devices are going to increase personal convenience so dramatically that it will become as unthinkable to leave your home without them as it would be to leave your home without a cellphone today. Eventually of course, technologies like these (and other supporting technologies) will probably make it unnecessary to leave your home at all.